Yeah baby, it is that time again. An eclipse just happened! They are amazing astronomical events to witness without a doubt and I highly encourage people to go view them and take snaps! It also brings out a lot of the professional photographers who wish to show off their amazing skills. Photoshop skills that is. Of course, they definitely let you know just how fake the images are when they describe the image as a "composite image" for their fans. Honestly though, I'd assume a composite image somehow still represents reality if you are trying to pass it off as photography instead of fantasy artwork. I mean, sure, I get it. You love those thousands of likes and shares you get with snaps that don't represent reality at all. Don't get me wrong. I'm just saying maybe we could label the images a little more accurately? Above we have an fantastic ultra patriotic image that was shared tens of thousands of times online. While the photographer did admit to it being a "composite" with the moon scaled up 75%, I found it to be a bit more of a complete work of fantasy after some analyzing. If you can find a few reference stars in the image, it isn't super difficult to calculate the image scale in degrees per pixel. 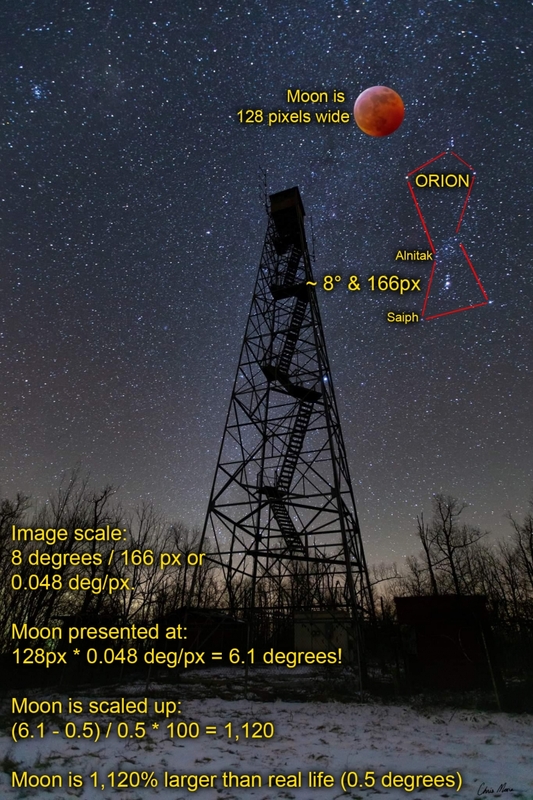 Unfortunately for photographers it is an astronomical fact that the moon doesn't occupy more than 1/2 of a degree in our wonderful night sky. By complete coincidence, the sun also occupies 1/2 of a degree in the day sky. Due to this astronomical oddity we can have perfect solar eclipses of the sun by the moon, something that wasn't always possible in the history of the planet. So, using this information, how do we figure how just how fake the images are? Easily. 1. Measure the distance between the two stars on the night sky in planetarium software. In this case, about 8 degrees. 2. Measure the same distance in the image in pixels. 3. Derive image scale by dividing the distance in degrees by the distance in pixels. 4. Measure the moon width in pixels. 5. 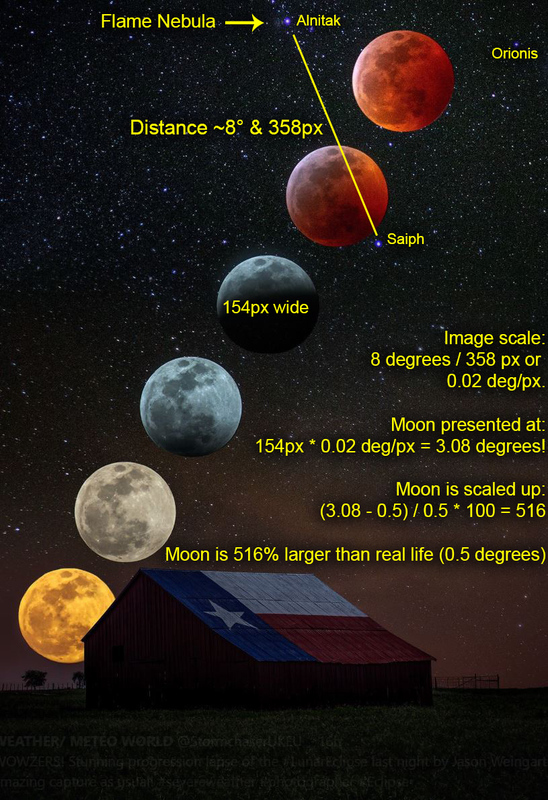 Multiply this distance by the image scale in degrees per pixel to see how big the moon was presented in degrees. 6. Convert that to a scale factor above 1/2 (0.5) of a degree. After easily figuring out the moon was scaled up over 500%, you could do a little more investigation to see that the moon was actually moved into an area of the sky it doesn't belong, and put on a trajectory that doesn't even come close to representing the real path it would take on the night sky. Combine this information with the evenly spaced completely not chronological sequence of the event itself, and I can comfortably say this is a fantasy version of something that doesn't even come close to reality at all. 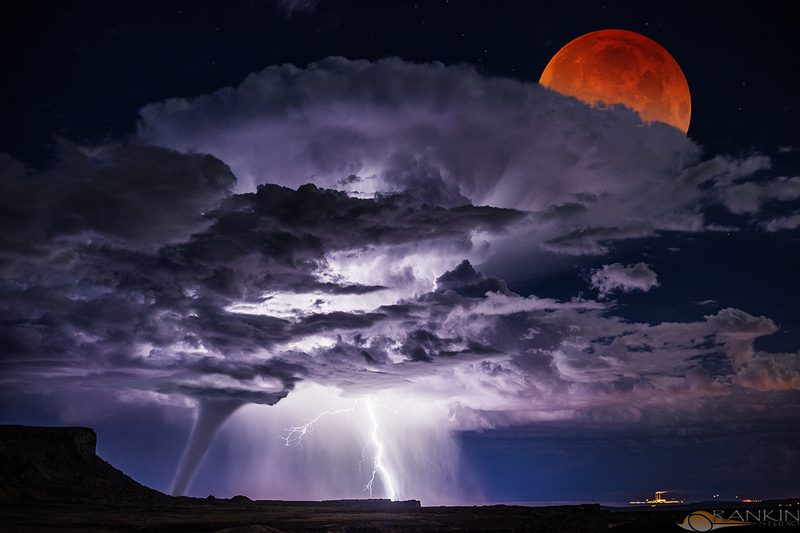 Here is another fantastic image of the eclipse! This time the moon was only scaled up about 1000%. Not bad! Comedy aside, I do think this raises some ethical questions us photographers should look at when creating complete fabrications of something that was supposed to be real, then passing them off as "composite images". Maybe the term "composite image" isn't strong enough? I'm thinking when you bust those Photoshop skills out and create a complete work of fiction, that you should probably label it as "fantasy artwork" or something to this effect. I think it is a bit more honest for our many fans out there, and maybe other photographers won't be so quick to lose their minds.